The Pentagon must hold down its spending and make choices that will anger “powerful people” in an era of economic strain, Defense Secretary Robert Gates said in a weekend speech in Kansas. I had pointed this out in a video I made a few years back, granted this was focused on the War on Terror and the Bush Administration’s Policies, but let’s be honest, so far Obama hasn’t exactly brought the budget into control for defense or overall. Granted economically he was more challenged by failed policies of previous, but he hasn’t (publicly) shown to have reduced the defense budget or spending. Now I am ex-military and insist we arm and equip our service people with the tools needed to carry out their mission, but when we are so overwhelmingly big vs our next competitors, it really shows we’ve gotten out of hand in our priorities and spending. Given that we’re touting how our taxes are the lowest in years, I’m curious how we think we can stay viable when we are running ever larger deficits and spending more with each year relative to our economy? I guess the theory is if we can beat the rest of the world up, we can’t be forced to pay our debts. Edgy and very tech related, but I found this Tech Cartoon Site a while back and never posted a link. So here is a link to the site. A recent favorite: A Salute to Bio Majors. If we join you against the Chemists, will you train our fleshy minions to leave us alive? So it’s approaching seven years of the anniversary of 9/11, and one can argue that progress has been made to better secure our country against the threats of low intensity, asymmetrical conflict (for those not familiar with those terms, read that as terrorism, though really that term is nearly meaningless now with all the ways it is abused). But for as much security and security theater as we have, there is still a notable opportunity for pork barrel spending, cases of misuse after misuse after misuse, and heck even lots of just plain incompetence to go around. Business Week shows that many Department of Homeland Security (DHS) projects are plagued by trouble and their own IT Systems might not be secure. And with all of the focus on airports, we might just be missing out on the bigger threats like our borders. (This isn’t meant to extend to the immigration debate, only in so far as terrorists can in fact cross the border in many ways not guarded today). Heck even MI5 has come out and stated there is no profile for a terrorist candidates or potential recruits and Malcom Gladwell states profiling doesn’t really amount to much. But they did warn us about liquids that can be dangerous, and Yankee Stadium got into the spirit of things by confiscating sunscreen. So how do we do this? What’s the right answer? I’d suggest to start with the basics, and that is that a cost benefit analysis and some rational thinking, which would go a long way to resolving this. Oh yeah, and remembering that life isn’t safe. Ever. Terrorism is nasty, no doubt, but it’s not likely going to be the thing that kills you. 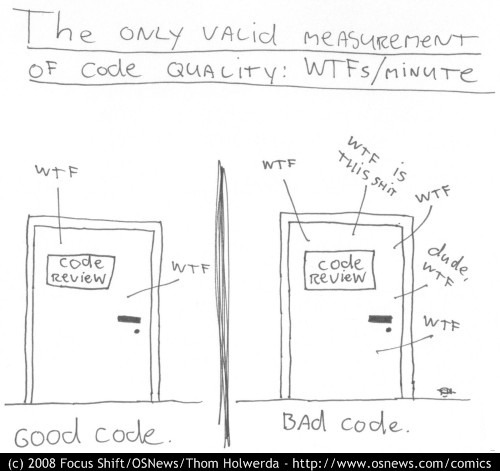 How do you know if you have good code? Ok, I saw this on the site of the Veracode folks a while back, but it still bears mentioning, or as they say in some circles QFT. So lots of folks have been wondering about a security mindset and how that maps to product creation or implementation of software. Some even state that this mindset is in fact part of mathmatics and can be taught there. Security is about thinking about stuff and how it can be broken, and the usual computer engineering is more busy thinking about stuff can be built. The trick is, we need our builders to think about BOTH while building systems, or we can’t sufficiently and cost effectively move away from security as a separate governance to an engineering process. And if we can’t do that we’ll be stuck paying for security as an after thought, vs having security “built-in”. I see trending that this might be changing at the OS / platform level, however the Web 2.0 and Cloud / Grid folks really seem to need to pick up on this lesson.